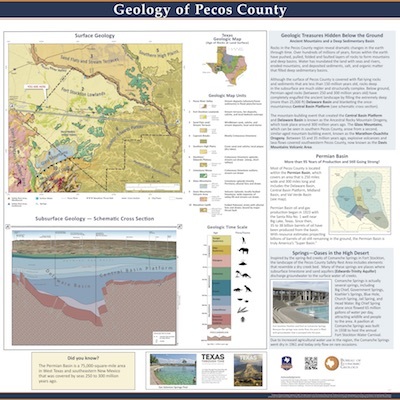 The Texas GeoSign Project was launched by the Bureau of Economic Geology in 2016 to establish a network of geologic information signs to engage and educate people when they visit parks, highway rest areas, and other public locations. We plan to add at least two new GeoSigns each year. Rocks in the Pecos County region reveal dramatic changes in the earth through time. Over hundreds of millions of years, forces within the earth have pushed, pulled, folded and faulted layers of rocks to form mountains and deep basins. Water has inundated the land with seas and rivers, eroded mountains, and deposited sediments, salt, and organic matter that filled deep sedimentary basins. 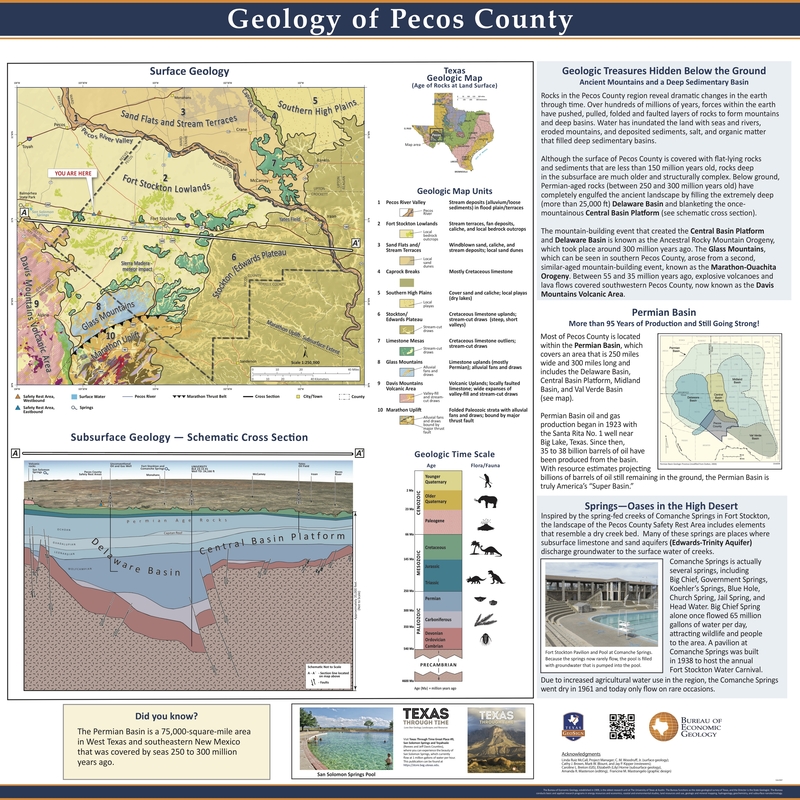 Although the surface of Pecos County is covered with flat lying rocks and sediments that are less than 150 million years old, rocks deep in the subsurface are much older and structurally complex. 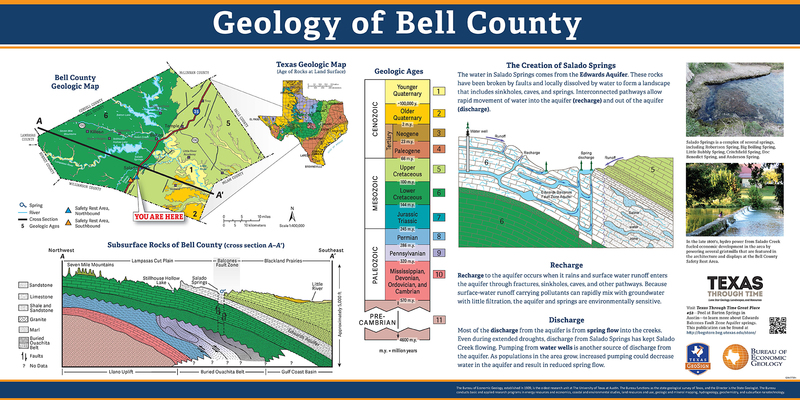 Below ground, Permian-aged rocks (between 250 and 300 million years old) have completely engulfed the ancient landscape by filling the extremely deep (>25,000 ft) Delaware Basin and blanketing the once-mountainous Central Basin Platform. The water in Salado Springs comes from the Edwards Aquifer. These rocks have been broken by faults and locally dissolved by water to form a landscape that includes sinkholes, caves, and springs. Interconnected pathways allow rapid movement of water into the aquifer (recharge) and out of the aquifer (discharge). Salado Springs is a complex of several springs, including Robertson Spring, Big Boiling Spring, Little Bubbly Spring, Critchfield Spring, Doc Benedict Spring, and Anderson Spring. In the late 1800's, hydro power from Salado Creek fueled economic development in the area by powering several gristmills that are featured in the architecture and displays at the Bell County Safety Rest Area. What kinds of rocks are in Eastland County? Sedimentary rocks including sandstone, shale, and limestone exist in Eastland County. The oldest rocks at the surface were deposited more than 300 million years ago, when this area was covered by an ocean. Are there any oil or gas fields in Eastland County? 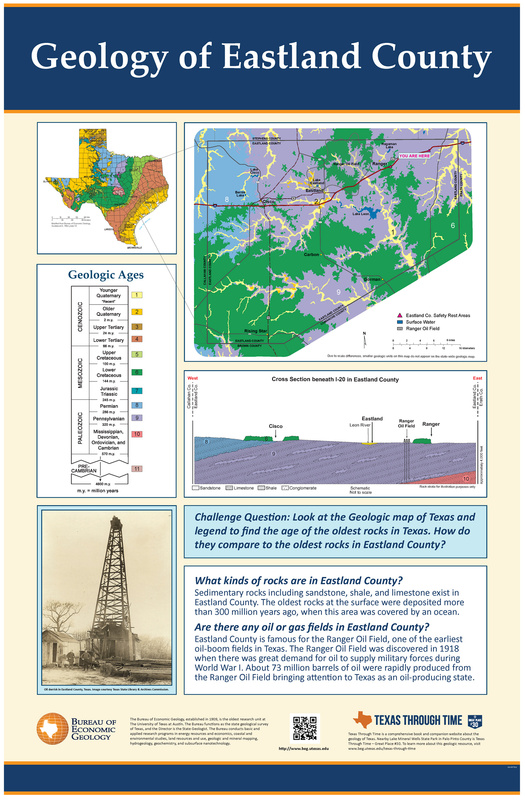 Eastland County is famous for the Ranger Oil Field, one of the earliest oil-boom fields in Texas. The Ranger Oil Field was discovered in 1918 when there was great demand for oil to supply military forces during World War I. About 73 million barrels of oil were rapidly produced from the Ranger Oil Field bringing attention to Texas as an oil-producing state. 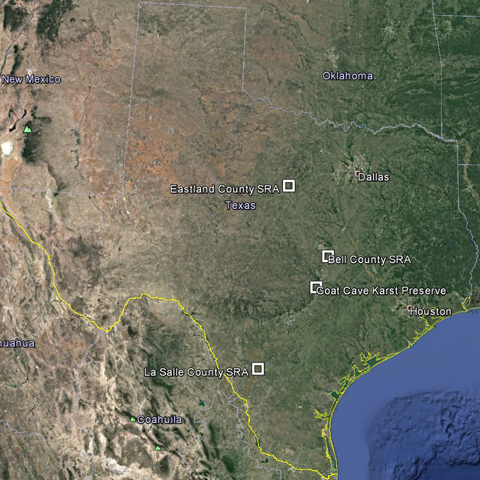 Eagle Ford Shale is a major energy resource for Texas oil and gas production. 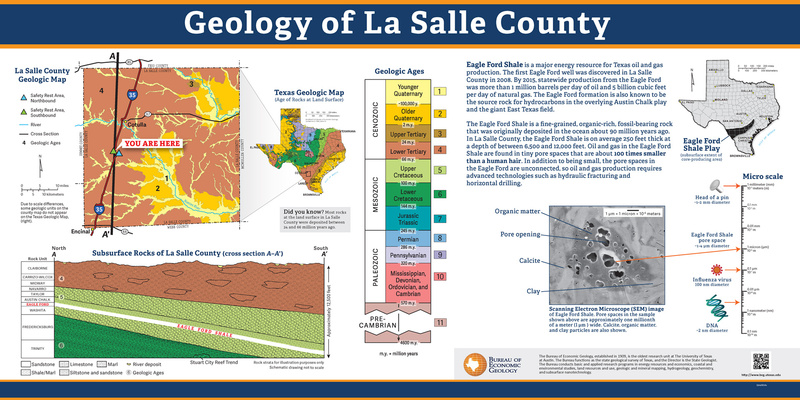 The first Eagle Ford well was discovered in La Salle County in 2008. By 2015, statewide production from the Eagle Ford was more than 1 million barrels per day of oil and 5 billion cubic feet per day of natural gas. The Eagle Ford formation is also known to be the source rock for hydrocarbons in the overlying Austin Chalk play and the giant East Texas field. The Eagle Ford Shale is a fine-grained, organic-rich, fossil-bearing rock that was originally deposited in the ocean about 90 million years ago. In La Salle County, the Eagle Ford Shale is on average 250 feet thick at a depth of between 6,500 and 12,000 feet. Oil and gas in the Eagle Ford Shale are found in tiny pore spaces that are about 100 times smaller than a human hair. In addition to being small, the pore spaces in the Eagle Ford are unconnected, so oil and gas production requires advanced technologies such as hydraulic fracturing and horizontal drilling. The Goat Cave Karst Preserve is located in highly fractured rock formations containing several caves and interconnected passages. 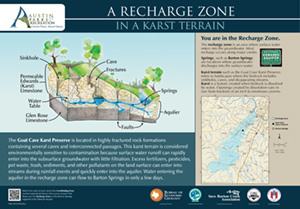 This karst terrain is considered environmentally sensitive to contamination because surface water runoff can rapidly enter into the subsurface groundwater with little filtration. Excess fertilizers, pesticides, pet waste, trash, sediments, and other pollutants on the land surface can enter into streams during rainfall events and quickly enter into the aquifer. 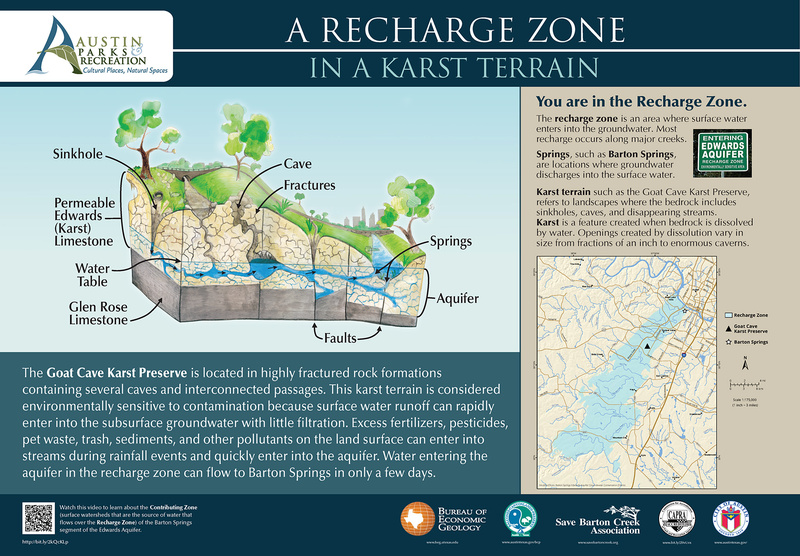 Water entering the aquifer in the recharge zone can flow to Barton Springs in only a few days.